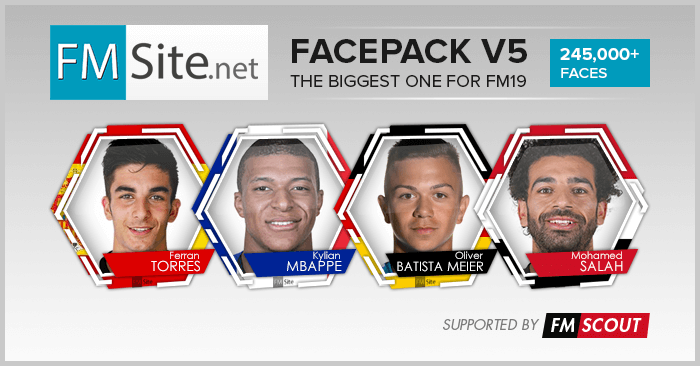 One of the largest facepack for Football Manager 2019 made by the Spanish community of FMSite.net. The creative team behind this facepack aims to create a beautiful style and combine the speed of production with accessibility for the general public. This pack includes more than 245,200 faces in unique hexagon style. It is intended for use with FM19, but it will work with all versions of the game from FM08 onward. FMSite will likely repack the megapack to v6 soon. That shall include v5+updates. This facepack includes pictures of all the players and staff created so far, that exceed 245,000. All these faces are inside a folder named "Player". Alt: This is short for Alternative; inside this folder you will find alternative pictures of those most famous players. Its use is simple; if you prefer the alternative pictures, simply move them inside the "Player" folder and overwrite. Extras: This folder may be a quick guide for installation, FM Graphics Configurator for creating XML files and a default version of the basic faces. Currently the "Download Now" big red button points to the torrent file that include all 10 base parts as 1 file. If you're not familiar with torrents, it's best to avoid it. But if you really want to get this pack via torrent AND help others get it as well, you need a torrent client. I personally recomment qBittorrent. There are 10 base parts, each of them is 1.1 GB except the last (10th) that is 768 MB. There are 5 update packs. Download either the torrent + updates, or all 10+5 parts which are in .rar archive format and use a tool such as 7-zip for Windows or The Unarchiver for MacOSX to extract their contents. First extract the base pack (or its parts 1-10), then move to the updates but do it in order (1-5). Every time you extract an update, overwrite the files and folders it asks you to. Open Football Manager 2019 and go to Preferences > Interface. Hexagon facepack style is created by the creative team at FMSite.net! Original FMSite Faces download page in Spanish. when in 4% "problème de connexion"
Nice facepack , how can I create my own pics with the same style ? when i reload this page - i can see just the small face and the big face photo doesn't upload - can anyone help?